Train tickets (check), new T & smart jeans from Zara (check), freshly printed business cards (check). Today is a rather busy day because I am hurriedly preparing to make the journey to London where I will attend a very special and significant event; the eagerly anticipated launch of Bright Bazaar aka Will Taylor's, Embracing Colour for Make-You-Smile Style. The reviews of Will's debut book are as bright and glowing as his blog posts and I will be sure to pick up my very own copy - yes even a minimalist like me is inspired by his exhilarating #MakeYouSmileStyle! However, today is about more than just a single event, it's about a young gay guy boldly flying the flag for creativity and British talent, a 'gentleman hooked on hue' who is helping to define a colourful new and exciting era of blogging around the world. As a relative newbie to blogging, I have received some great advice and mentoring from Will, for which I am eternally grateful. If there's one thing that we should take from this book, it's that if you work hard enough for something, your dreams can come true - just ask Will. 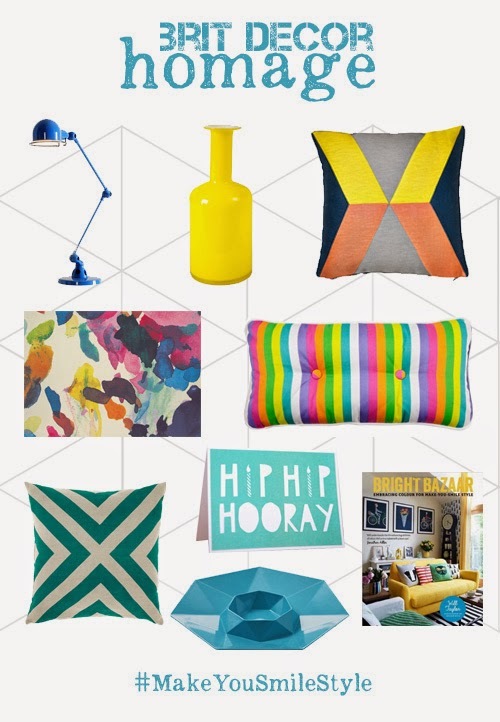 So in homage to the king of colour, I have today stepped away from the greys (almost) and simply couldn't resist embracing a colour-burst palette of shopping brights 'above' from some of my all time favourite stores, which I hope you will enjoy. I feel in the mood for a celebration, don't you?